Dresden was such a surprise. 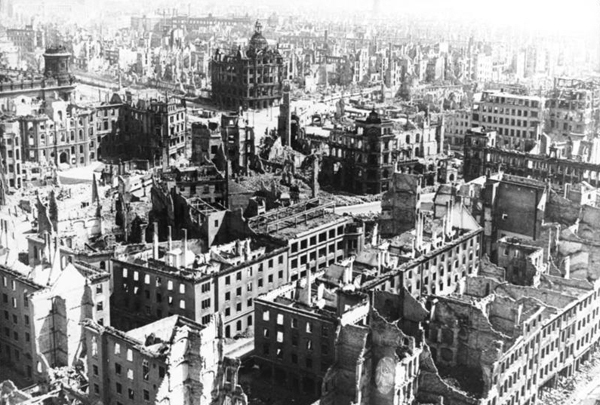 Until my visit to this ancient city last fall, I only connected Dresden to the destructive 1945 allied fire bombing which reduced the city to a heap of smoking ruble and killed thousands of civilians. 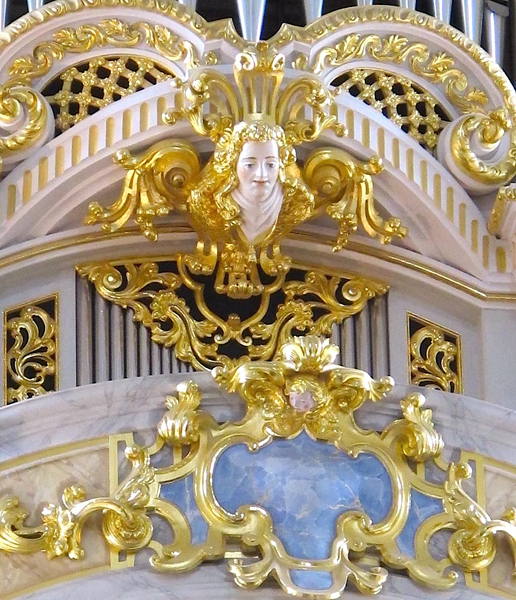 For centuries, Dresden, the pride of Saxony, had been a cultural and artistic center. 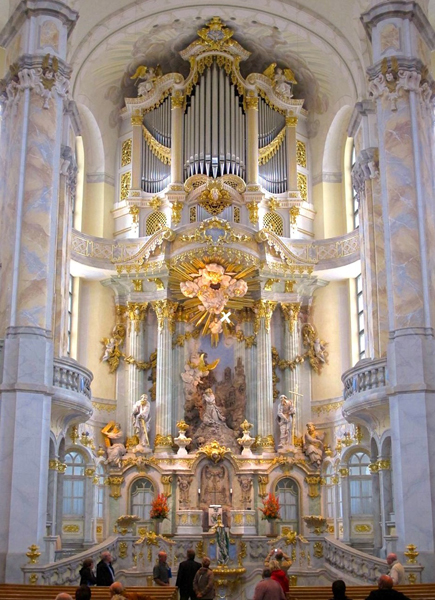 With it’s spectacular mixture of Baroque architecture sitting on the banks of the Elbe river, the city was also called the “Florence of the North” – but all that was burnt to the ground. So, I was expecting a palette of sad grey avenues but instead I discovered a vibrant, beautiful city, in the throws of a true Renaissance. 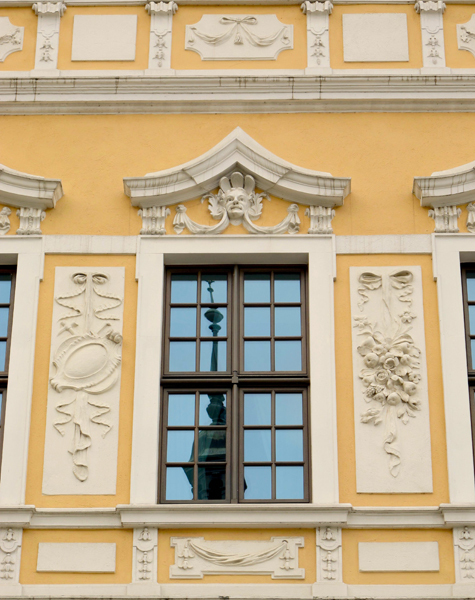 Dresden is being restored to its original glory. 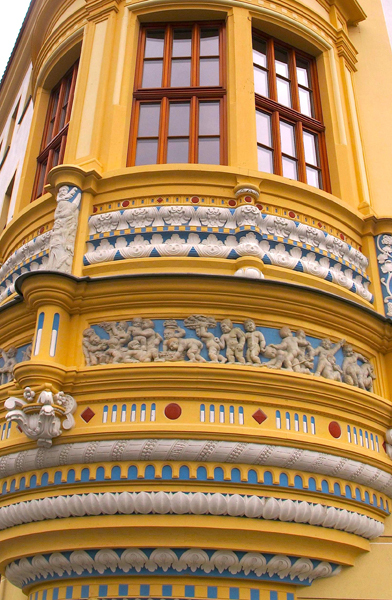 Bright cheerful colors dominate town squares, ornate friezes and whimsical moldings embellish elegant buildings …the buzz of renewal is palpable. Built in the 18th century, it gave Dresden a distinctive silhouette with its 96 meter high dome and for 200 years it dominated the city. 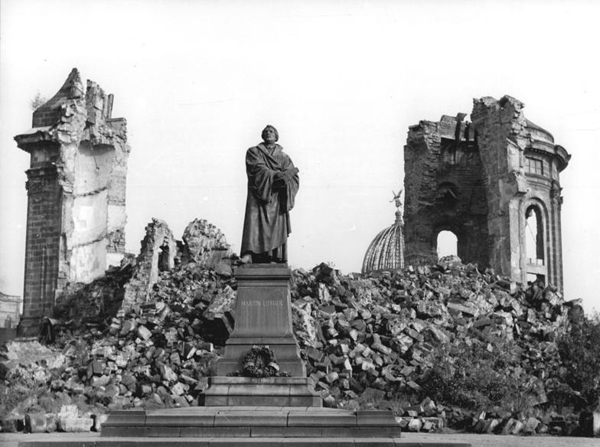 When the allied forces began the bombing, the church withstood two days and nights of the attacks but the dome eventually collapsed from the surrounding heat. 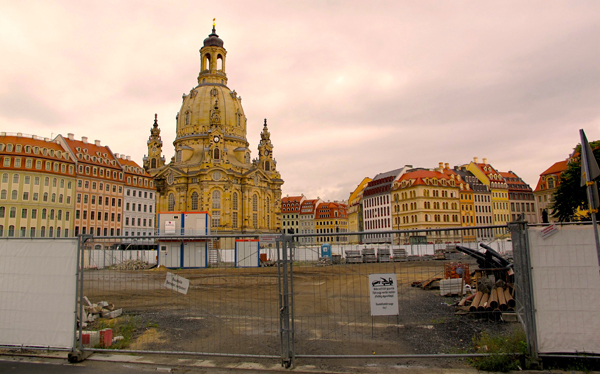 The church vanished from Dresden’s skyline and the blackened stones lay in wait in a pile in the center of town for the next 45 years. In 1982, the ruins began to be the site of a peace movement combined with peaceful protests against the East German regime. After the wall fell and the reunification of Germany, serious reconstruction efforts began. Thousands of people from all over the world got involved in the resurrection of the church, donating time, money and expertise. 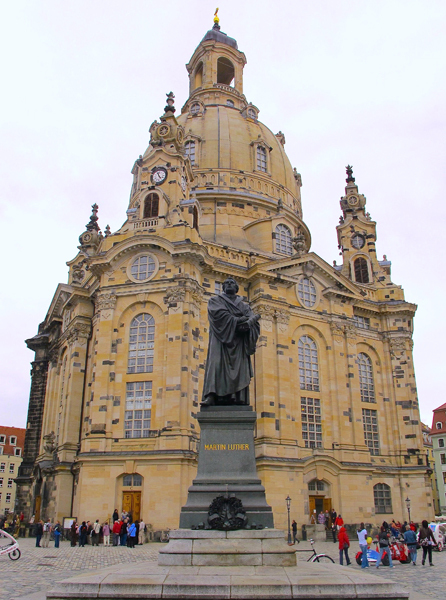 The Frauenkirche became a symbol of peace. It now rises again impressively out of the central square – a checker board pattern of new and salvaged stones. 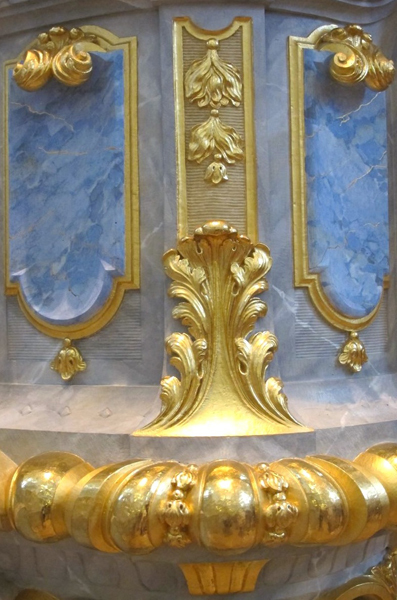 The interior is magnificent and overwhelming – the festive intensity of the colors, their exaggerated harmonies and ornamentation, the explosion of gold and splashes of silver create a sense of unabashed joy and celebration. 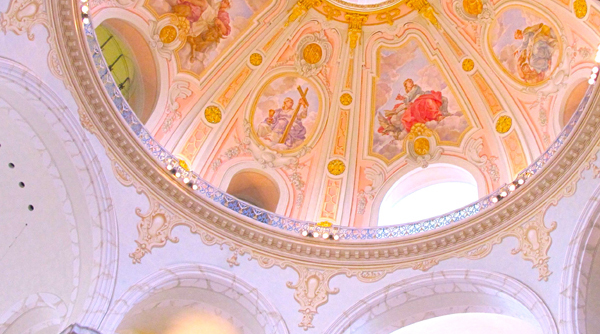 And yet with its alcoves devoted to remembrance and forgiveness, this grandiose structure remains strangely intimate. 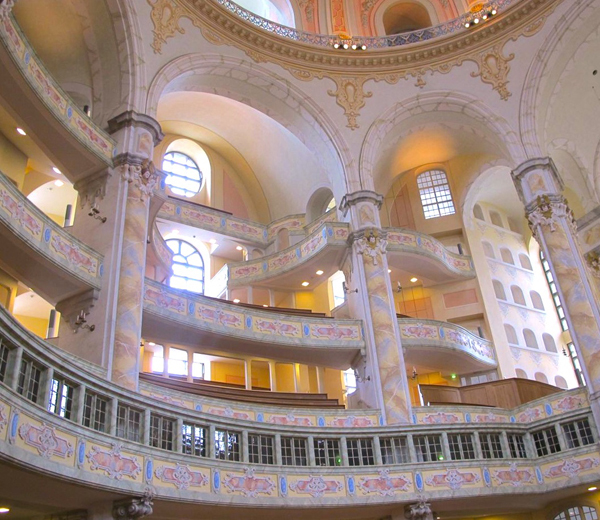 The FrauenKirche has become a monument reminding people of its history and a symbol of hope and reconciliation. 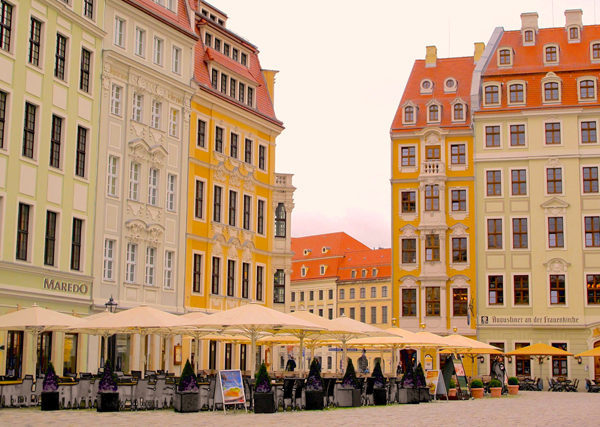 For all you color lovers, Dresden is well worth a visit and its very close to Prague.